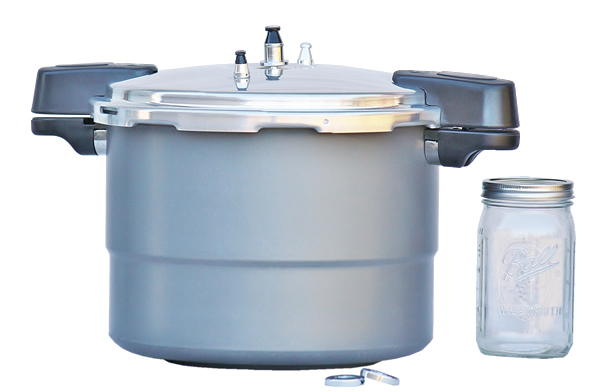 GraniteWare, the leader in water bath canners and enamel cookware, is proud to introduce their 20 Quart Pressure Canner. It elevates food temperature to 240 degrees Fahrenheit, enough to sterilize even low-acid foods by killing bacteria and botulism spores. This canner comes with a 3-piece pressure regulator, which allows you to select 5, 10, or 15 pounds of pressure, as well as a wire canning rack. Additionally, a convenient steamer insert can be used to make huge batches of tasty vegetables. Safety features include locking handles, two safety valves (spring-loaded and whistling alarm), and a hard, anodized steel construction. This GraniteWare 20-Quart Pressure Canner is just right for your kitchen! Will this work on an induction stove? This canner is constructed from aluminum so it would not work on an induction stove. Is this cooker compatible with a propane/gas stovetop? I need one that can be used on such a stovetop. Is this canner compatible with an induction cooktop?